Have you ever wanted to look into your wardrobe and gasp, "It's full of stars"? Shadowplaynyc blends fashion with astronomical fascination, using real images from the Hubble Telescope as the prints for their clothing and accessories. Now you can show off your favorite nebula by pulling on a pair of tights. Parsons graduates Ali Bennaim and Ximena Chouza handcraft each of their Hubble-print items using a technique that minimizes fabric waste. 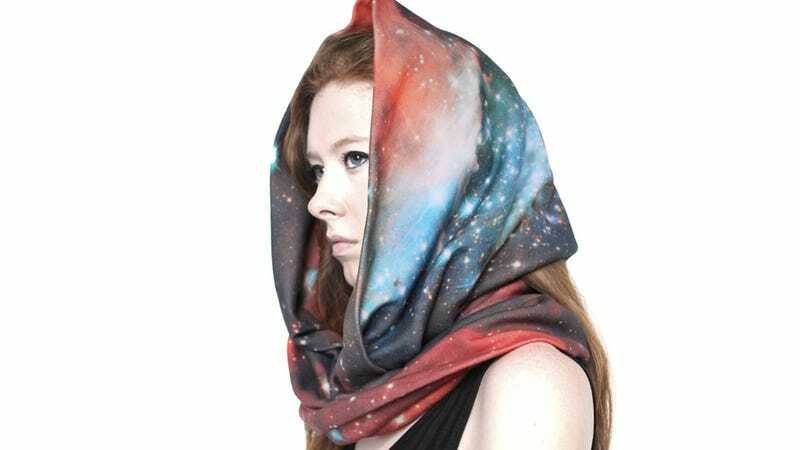 In addition to these starry items, they also sell handkerchiefs printed with Ziggy Stardust and the famous Apollo 11 moonwalk photo, as well as t-shirts reading "Occupy Outer Space." You can see the entire line, and covet those Small Magellanic Cloud Nebula tights, at the Shadowplaynyc website.